Inspired by the wonderful work of Anne Stokes, this Mystic Aura Incense creates a mystical feeling within your home. 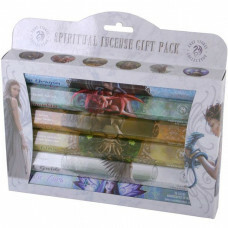 Inspired by the wonderful work of Anne Stokes, this gift pack contains one pack of each Spiritual In.. Featuring the "Mystic Aura" artwork in 3D by the amazing Anne Stokes this evening bag will be sure t..